For those of you who might be interested in developing on Mac OS X, it looks like the only useful thing we're missing is the py2sis application from the SDK which is a Windows only tool. If you're interesting in using the Bluetooth console facility to develop directly on the phone under Mac OS X, this is fairly trivially done. First of all you need to create a serial port that the bt_console.py script on the phone can connect to using the Bluetooth Serial Utility which is found in Applications > Utilities. Then you need to run a terminal emulation program on you Mac to monitor your newly created port, I'm using ZTerm to do that. Then just run the bt_console.py script on your phone as normal. ThinkSecret is peddling the rumour of a headless iMac soon to be available for less than $500, I'm less excited about this than I could be because it'll ship in the UK at just under £500 despite an exchange rate of almost two dollars to the pound. Apple has stayed clear of the sub-$500 PC market for very obvious reasons, so I'm going to be suprised if such a thing as a headless iMac comes to pass, but there are lines of arguement not mentioned by ThinkSecret that do make it seem like an attractive proposition to Apple this time around. I'm going to be watching this one closely, even if it turns out that in the end I can fly to New York, buy a headless iMac, and fly back to the UK for less than the price of an "native" UK iMac. So much for the global economy. I've known that there has been a "secret" developer release of Python available for a while now from Nokia for Series 60 phones, such as my Nokia 3650 and 6600. However what I'd totally missed, was the public release of Python for Series 60. I'd tried developing applications for the Series 60 using Java ME and found it hard going, despite having a fair bit of "normal" Java experience. It was especially hard going since I don't use MS Windows and couldn't take advantage of most of the infrastructre that has been written specifically to make things easier for the developer. While I was struggling with Java the rumours of Perl for Series 60 leaked out of Nokia, I more or less stopped working on trying to get my head round Java ME at this stage, despite actually having a working toolchain and some tinkertoy level applications running. I was vastly disappointed to latter learn that Nokia was going to go with Python not Perl as their choice of high level language. I've played with Python in past and I definitely prefer writing Perl. But even Python is a vast step forward over the intricacies of Java ME, so I was still somewhat cheered by the prospect of any decent high level language appearing for the Series 60 platform. I'm currently downloading the SDK. I'm discouraged that it seems to be shipped in zip format, as I'm hoping the toolchain isn't platform specific. However, I've seen other people are talking about developing from Linux so I'm hoping I'll be able to do so from Mac OS X which is my prefered platform these days. More information about the release can be found on the Python for Series 60 Wiki site. Update: I managed to get Python working and developing under Mac OS X is quite simple. I even managed to get it to do something useful, well sort of, in a fairly short time scale. No sooner had I finished bemoaning the fact that we're not doing anything about the threat possed by NEOs, than Slashdot reports that the B612 Foundation has been established to do something about just that. We rely on Google a lot, but where should this stop? The first port of call for someone who'd just recieved my CV will probably be Google. Over the years I've posted a good deal on Usenet, but I've used a lot of different routes to do so, and posted using several different email addresses. It might be hard for someone who doesn't know about my non-work interests to figure out which posts are mine, and which posts belong to someone else. Would they even go to the trouble of doing this? I could end up not getting a job because of what someone else with the same name said five years ago. That's pretty scary! But what's more scary? What happens when you insurance company starts googling you before giving you a policy, you really shouldn't have mentioned your love of hamburgers on your blog. Or, maybe it isn't your blog at all? Want to try and convince your insurance company? I was expecting more reaction to my recent post about global warming and extinction level events, but I got much less mail about that than I did regarding my post talking about the recent Apple iPhone rumours. Then you get a close call, and an asteroid passes near by and you end up with a bucket load of mail in your inbox. While it was pretty small at only 5 meters, and would probably have entirely burned up in the atmosphere depending on the composition, 2004 YD5 passed below geostationary orbit and was the second closest asteroid approach ever observed. The closest involved 2004 FU162 that flew by last March which we didn't even spot until August. Like all the other near misses, this one illustrates that we really should be doing more to detect near-Earth asteroids before they become a threat. It's always suprised me that the Shoemaker-Levy 9 impact with Jupiter in 1994 didn't cause more comment. After all, what sensible species would watch a rock the size of a large mountain strike a nearby planet and then do absolutely nothing about it? Looks like I wasn't the only person blogging the AstroGrid rollout meeting at the NeSC. There were a lot of WiFi enabled laptops in the audience, so I'm not that suprised. Maybe I should wear my "I'm blogging this..." t-shirt next time? Next up was Guy Rixon who talked about the AstroGrid architecture. He pointed us to the architecture document which describes the architecture of the current iteration 6 release. This was followed by a break away session where we sat down and talked about what we wanted out of AstroGrid-2 and what bits of the architecture needed tweaking. There was general agreement that, amongst other things, the portal is perhaps the real weakness of the current infrastructre and lets down an otherwise fairly good workflow system. A workbench system with an interface similar to Triana, or AVS, was suggested as a portal replacement. The second day of the AstroGrid rollout started with Andy Lawrence talking about AstroGrid-2 and Euro-VO, and AstroGrid's relationship with them and also with the AVO. AstroGrid will be leading the VO Technology Centre (VOTC) which will be a loose confederation to develop new technologies for Euro-VO. VOTech is the first project under the VOTC umbrella funded by EU-FP6 and partner contributions. Formally VOTech is a design study which will output reports, designs, prototypes and proto-standards. In contrast to the engineering focus of AstroGrid-2, VOTech is a research and development project. This was followed by Tony Linde talking about AstroGrid-2 and what it's going to be doing over the next 3 years. We closed with several more talks on the technical details behind the workflow and the scripting infrastructure. The second to last talk by Neil Winstanley should probably have been right up front. We finally got some more details of the reasons behind the choice of Groovy as the workflow scripting language, some explaination of how to hook these scripts into the workflow, and what and when you need to do that. After hearing this talk I was somewhat happier about the capabilites of the workflow engine. However, I'm still very unsure as to whether the interface being presented should be represented as the "user" level. It seems too low level to be offered directly to an average user. Martin Hill talked about the Publisher's Astrogrid Library (PAL) and how to use it to serve your data. Looks interesting, and fairly feature complete. He pointed us all at a PAL wrapped version of 2MASS, amongst others things, as an example. After coffee we moved on from Workflows, and Elizabeth Auden taked to us about the Registry. Elizabeth took us through the registry portal and showed us how it worked. We've had several workflow demos now, and I'm disappointed by how complex it looks to try and use the workflow engine. This seems especially evident from the Solar Movie Maker demo which seems to rely very heavily on fairly extensive user scripting in Groovy. We've just come back from the lunch break and are we're now into the crucial part of the meeting, the actual demo. Nic Walton did the warm up and talked about the helper applications, such as CDS Aladin and Starlink's TOPCAT and Treeview applications. ...and indeed a good number of the people in the audience seem quite worried by the choice of Groovy as the scripting harness for the workflow engine. We've slid into a long and detailed discussion about what should be user scripted and what workflow should provide natively. I'm very confused about why aplications which already has a workflow harness needs user scripting to stick them together? Surely that sort of thing should be entirely transparent to the user? Guy Rixon is talking about how AstroGrid connects to other projects. So far he's mentioned the eSTAR-like agent architectures agreed at the VOTech kickoff meeting, and external applications like those produced by the Starlink project. Following a talk about the GridPP project by Tony Doyle, the next talk was about the AstroGrid (AG) infrastructure by Tony Linde. He seems to be trying to emphasize the mix and match nature of the current AG infrastructure, you can take one, some, or all of the various AG software components depending on your needs. He's also talking about the forthcoming AstroGrid-2 work. During this he mentioned the proposed work on agents which has been recommended by the VOTech working groups at the kickoff meeting. I'm now at the NeSC listening to inital talks during the AstroGrid rollout meeting. If you want to participate in a the beta test of the AstroGrid infrastructure you need to mail Nic Walton to ask for a login to the system. I caught my commuter flight to Edinburgh mid-afternoon, and I'm now holed up in the Jury's Inn in Edinburgh. You can tell I'm flying from a regional airport, right? The hotel is only a couple of streets back from Edinburgh Waverley and Princess Street and therefore rather convenient for, well, virtually everything, including the Edinburgh Christmas Market. Funny thing about that, you wait all year for a German Christmas Market, and two come along at once. This post is brought to you through the magic of Bluetooth and a GPRS connection, as one thing this hotel certainly doesn't have is a broadband connection. I'm back in Exeter from my adventures in London, where I attended, and in fact spoke at, the London Perl Workshop which was organised by London.pm. The main hall where the Plenary session and the Learning Perl track was held. I spent most of my time upstairs in the much smaller, and less photogenic, room where the Advanced Track as being held. I think my talk on the Advanced Track went over fairly well in the end. I got some nice comments and a nobody tried to rugby tackle me over my politically incorrect statement that legacy software was, despite initial appearances, a good thing. For the most part, when not be evangelical, I talked about Inline::* and SOAP::Lite which I was surprised to find weren't already in widespread use amongst this crowd. The most interesting talk of the day for me had to be Simon Wistow's talk about his Whatif module. Originally in the Acme::* namespace, and for good reason, he moved it out of there when he discovered that people were actually crazy enough to use it. Eric Saunders was also at the workshop with me, and I think it's a safe bet to say that he found José Alves de Castro's talk on "Obfuscation and Golfing" the most interesting of the day. For those of you not in the know, obfuscation is all about making your code as totally unreadable as possible in cool and interesting ways, while golfing seems to be a uniquely Perl phenomenon where you try to write code in as few characters as possible. On the down side I'm officially back in transit. Lunch time tomorrow I'm catching a flybe flight from Exeter to Edinburgh so I can attend the AstroGrid rollout which is on Tuesday and Wednesday at the NeSC. Some time soon I really have to stop moving, sit down, and write some software. But with Christmas coming up, you have to figure it's going to be the new year before I get a decent stretch of "real work" done. Okay, this has to be one of the most instantly useful things to come out of Google Labs for a good while. Google Suggest offers keyword suggestions in real time as you type your search terms into the query box. It doesn't seem like an Earth shattering idea, and it isn't. However it's one of those things that, once used, you instantly feel is the way it should have worked all along. Google Suggest uses XMLHttpRequest to query Google as yout type, giving you a drop-down auto-complete box with the most likely results. The drop-down box is updated in real time as you continue to type. I'm in transit to the London Perl Workshop which is being held tomorrow at the Imperial College Student Union. I've actually volunteered to give a talk on the Advanced Track about legacy software and I'm got a funny feeling I might not have made it quite advanced enough, this is the London.pm crowd after all. As an astronomer you get used to thinking in the long term. A few million years is a relatively short time scale when you reguarly deal in time scales of billions of years, so when someone tells you something bad is going to happen in only a few hundred years, you tend to take notice. Astronomers are also used to thinking about global catastrophes. The impact of Comet Shoemaker-Levy 9 with Jupiter in 1994 made the threat of Near Earth Objects very plain, and since then some money at least has been directed towards the hunt for such objects. After all, what sensible species would watch a rock the size of a large mountain strike a nearby planet and then do absolutely nothing about it? There are other possible extiction level events. A nearby supernovae could send a wave of lethal radiation towards us, stripping the protective ozone layer from our planet, indeed it has been suggested that this may have happened before. Closer to home, the eruption of a Supervolcano might make all our worrying about mankind's effect on the climate totally irrelevant. Part of a massive tabular iceberg adrift in the Weddell Sea off the Antarctic peninsula. In Antarctica, the recent break-up of ice shelves has precipitated increased streaming of ice from much farther inland, which potentially represents the initiation of a phase of much more serious ice-sheet collapse. We can do little about the most of the external threats to the continuation of our species, at least for now. Maybe in a few hundred years, if we get lucky enough to make it that far, then we will have the technology to address at least some of them. But Jan Zalasiewicz's recent article in The Guardian suggests we might not have those few hundred years. I'd recommend people read it, it scared me badly, and like geologists, astronomers don't scare easily. We're used to thinking about the world coming to an end, and maybe you should be thinking about it as well. There are yet more rumours flying about the possibility of an Apple iPhone. I talked about this in a previous post and I still think it's unlikely. Like a lot of people I think the rumours leaking onto the net about an iPhone are distorted versions of Apple's deal with Motorola to ship iTunes on their new handsets. The Korean Times is reporting that the Korean government have requested that wireless operators keep records of all text messages sent over their networks and the operators, depsite privacy fears from their customers, are bowing to government pressure. Of course we all know, or at least should know, that text messages aren't secure from prying eyes. But until now the prospect of widespread archiving of text messages hasn't really been discussed. Unless you were already being investigated by the police, or the security services, what you'd said in the past probably wasn't going to hang around to haunt you. Now, every single drunken text message could be sitting out there, waiting. Maybe the Americans have the right idea after all. The only integrated text message encryption application I can find is Fortress SMS. It claims to implement 128 bit RC4, but the application appears to be closed source so there really isn't any way to check this, you just have to trust the vendor. However the flaws in RC4 are well known, and I'm not sure I trust a vendor who provides a "A Comparison of Fortress Mail Encryption and X.509 based Public Key Encryption for Secure Email Exchange" but doesn't raise or address these concerns. If I'm going to encrypt something I'd prefer to use a public key encryption scheme over something like RC4. Perhaps it's time I pulled Applied Cryptography off the shelf and sat down and wrote something that isn't to do with astronomy for a change. Pantech have just released the first mobile which uses a fingerprint recognition sensor to identify the user. The new Pantech GI100 got a mention over at Gizmodo and Mobile Mag although with the sparse details I guess nobody has actually seen one of these things yet. From a British perspective there are two glaring problems with the phone's specification. The first is the absense of Bluetooth. Although little thought of over the pond, Bluetooth is everywhere in the UK. My phones, headset, laptop, PDA and GPS unit all talk to each other now, and I wouldn't want to return to the days when they couldn't. Although considering the security flaws that have been discovered in the protocol perhaps this absence is deliberate in what is, after all, supposed to be a "secure" device? Either way, the crippling flaw is that fact that the phone is only dual band (900 & 1800MHz), making it useless in the States. Nearly every phone sold in the UK these days is tri-band, and most of the higher spec phones are quad band. So why have Pantech taken such an backwards step? The conspiracy theorist in me would attribute this to the fact that, in the current climate, the US would no doubt frown upon such a device. At least one which didn't have a backdoor for law enforcement types. Or perhaps the real reason is that, with all that extra circuitry for the biometrics, there just wasn't room to make the phone quad band? The Russian Energia Corporation today unveiled a mock up of their potential successor to the venerable Soyuz capsule. The reusable Kliper could deliver cargo, or a crew of six, to orbit and the International Space Station where it could remain docked for up to a year. The new spacecraft is a lifting body where the body of the craft itself produces the lifting force during reentry into the atmosphere. Unlike a traditional reentry capsules, such as Soyuz, which are limited to a narrow landing corridors along the ground track of their final orbit, the new craft would have significant sideways maneouvering capability. The Kliper's unveiling attracted a lot of attention in the Russian media, including television coverage and several articles [1, 2] on various Russian news sites. I'd guess that the vehicle in the background, behind the Kliper mock up, is the Buran OK-KS test vehicle. OK-KS was used for static electrical and integration tests, it never flew, and was not flight capable. Despite being much more capable the new spacecraft is expected to cost less per launch than Soyuz which itself costs less than a tenth as much, at around $30 million, as space shuttle launch. While there has been considerable coverage [1, 2, 3] in the Russian media, there has as yet been very little in the Western press. However MSNBC has now published a good article about the new spacecraft, so you don't have to get your Russian dictionaries out quite yet. However as this MSNBC article points out there are significant problems standing between todays mockup and an actual launch vehicle, and like most things in Russia today, the first is money. A production vehicle, currently scheduled for test flights by 2010, seems to be well beyond the meager funding levels currently allocated by the Russian government. However, in the long term, this might turn out to be the least of Energia's problems. The new spacecraft was designed to be launched using the Ukranian made Zenit booster. Considering the current political troubles in the Ukraine, which could easily spiral out of control, relying on a Ukrainian built booster to lift the new spacecraft may be unacceptable to both the Russians and the west. Russell Beattie has been indulging in some fantasizing about the direction in which Apple might be heading with his blog post about the the "iphone". I think he's dead wrong. The key thing about the sucess of the iPod, which I'm sure is clear to Steve Jobs, is that Apple broke into (invented) a totally new market and became the dominant player with a high margin product. The mobile phone market is anything but new, in fact, it's totally saturated and margins are vanishing thin. On top of this, his suggestion of "...a small version of OSX" is unfortunately totally off the wall. The iphone, not an Apple product, or likely to be one? I think this image comes from the UK magazine iCreate which has a habit of dreaming up possible new product lines for Apple. If anything, I think Ross Mayfield has a better idea. The thought of a WiFi enabled iPod is enough to make most geeks break into a sweat. It might not be as revolutionary, but it's a lot more likely. Interestingly, they're also offering authenticated SMTP as well. However, I haven't tested it yet to see whether it rewrites the headers to make it appear that the email was sent from GMail itself. If it does, that's going to make it a lot less useful than it initally appears, although somewhat less prone to misuse. The BBC is reporting that the second launch of the improved Ariane 5ECA will be in January next year. The first flight of the new Ariane 5 variant, in December 2002, was a failure. Leakage in the cooling system resulted in deformation to the nozzle of the main Vulcain-2 engine, which caused an abort in the first few minutes of the flight. As reported in several places, the Cassini probe has recently captured an incredible image of Saturn's moon Mimas. Saturn's moon Mimas is seen against the cool, blue-streaked backdrop of Saturn's northern hemisphere. The bright blue swath near Mimas is created by sunlight passing through the 'Cassini division'. The rightmost part of this distinctive feature is slightly overexposed and therefore bright white in this image. Shadows of several thin ringlets within the division can be seen here as well. The dark band that stretches across the centre of the image is the shadow of Saturn's B ring, the densest of the main rings. Part of the actual Cassini division appears at the bottom, along with the A ring and the narrow outer F ring. The A ring is almost transparent so that, from this viewing angle, the atmosphere and shadows cast by the inner C ring are visible through it. I was in Leeds over the weekend and, amougst other things, ended up at the German Christmas Market a "..little piece of Germany in the heart of Leeds" according to Leeds City Council. After many years of coming away from the Hill with less than they asked for, this year NASA received all of the $16.2 billion they sought for 2005. Not only will this money will cover the return to flight programme, but it will also provide funding for them to start designing a shuttle replacement and planning future manned moon missions. However all did not go to plan. There were some cuts demanded by Congress, and one of the most severe came at the expense of robotic exploration of the moon. Congress cut all but $10 million from the planned Lunar Reconnaissance Orbiter mission, which was to map the moon and attempt to find water ice that could be critical to human missions. Of course, despite the extra funding, what NASA's new priorities mean for its ongoing science programme is an open question. With little fanfare, except a short post on the Google Blog last Thursday, your friendly neighbourhood scearch engine has launched Google Scholar. Never talk to journalists, they have the horrible habit of reporting what you tell them, and in your own words no less. With the arrival of the the so called smart phones the software market for mobile devices is starting to resemble the MS Windows market, in more ways than one. Unfortunately one of these ways is the appearance of viruses and malware on the new platforms. The problem seems especially severe for the Series 60 platform, due to it's use by the major handset manufacturers like Nokia and Sony Ericsson, it's acheived an near ubiquity in the smart phone market. While I'm going to keep clear of the overused term virus, trojans are starting to appear. While they aren't in general self-replicating, worryingly some of them do display worm like properties. The BBC is reporting the latest trojan on the Series 60 platform, while they're (at the moment) reporting it as a Nokia 7610 problem I don't see why it would not be able to infect other phones based on the Series 60 platform. The screen from a Nokia 7610 infected with SymbOS/Skulls. If this happens to your phone it's important not to reboot the phone. This will overwrite the Symbian ROM images with the malicious code and complicate disinfection. Follow the disinfection proceedures before rebooting. On the face of things the new malware doesn't seem too worrying, until you sit down and have a serious think about things. The combination of a piece of malware which sends illicit text messages, in a similar manner to the SymbOS/Mquito trojan, with one which propogates using the bluetooth functionality of your phone, similar to SymbOS/Cabir.A or SymbOS/Cabir.B is a troubling thought. It's especially troubling considering the security flaws which seem to be inherent in the Bluetooth protocol. If a flaw is found that lets the malware propogate without user intervention, like a true virus or worm, then there could be a some very large phone bills landing on people's door mats. SWIFT, the joint NASA/ESA γ-Ray Burst Obsevatory mission, was successfully launched on Saturday. Spacecraft separation occurred sucessfully about 80 minutes after launch, as expected. On the first day there were over thirty 10 to 20 minute talks scheduled. Like a lot of people I thought this was total madness and we'd be running hours late by lunch time. Suprisingly perhaps, we weren't! There were several good talks, especially interesting was Giuseppe Longo's talk about neural tools for data mining in massive datasets and Norman Gray's talk on intelligent access to foreign data. Snow, in Cambridge, in November? Most odd! The second day was dedicated to workshops to discuss the previous days presentations, and where the VOTech project should be heading. The three eSTAR talks the day before had certainly attracted a lot of attention. So despite feeling that at times I was saying the word "agent" every second sentence, I spent the day waving my hands and explaining agent architectures. For those of you looking for a good background book on agent architectures, I'd point you towards one of my earlier posts. The Planetary Society has begun the count down to the launch of the world's first sola sail vehicle, Cosmos-1. It is currently scheduled for launch at the start of March next year. Engineers watch a zero-gravity simulation of the sail deployment and test its mechanical configuration. This photo was taken in January 2001 at NPO Lavochkin. If all goes to plan, Cosmos-1, which will be launched from a Russian nuclear submarine in the Barents Sea using a converted SS-N-18 Soviet ICBM (Volna), and operate for up to a month in low Earth orbit. An attempt in July 2001 to launch a pervious version of the vehicle on a suborbital flight, designed to test new technology for unfurling solar sail blades, failed due to a malfunction in the Volna launch vehicle. For those not familar with solar sails, you could do worse than having a look at my article for an introduction to the subject. The delayed flight of NASA's scramjet test vehicle, the X-43A has been completed sucessfully. The BBC is reporting that the ESA SMART-1 probe has sucessfully completed it's first lunar orbit. The probe's experimental ion engine will run almost continuously during the next four days to stabilse its orbit, allowing the probe to commence it observations sometime in mid-January. The Moon as seen by SMART-1 on 12 November, at a distance of about 60 000 kilometres. The slightly illuminated part at the top of the Moon shows a 'slice' of the Moon far side at about the latitude of the lunar north pole. The far side is seen for the first time by a European spacecraft, and ESA is only the third organisation to do so in the history of lunar exploration. This image is the last shot that the AMIE camera could take before SMART-1 prepared for the burn that will stabilise the spacecraft in lunar orbit. The BBC is reporting that the test flight of the X-43A has been delayed till later today as the vehicle failed some of it's pre-flight checks. In a couple of hours time the last scheduled flight of NASA's X-43A scramjet test vehicle will take place over the Pacific test range off the coast of Southern California. Despite this upcoming flight, future US led research into this technology looks to be unlikely. Funding for the Hyper-X long term research programme was cancelled following Bush's announcement in January that America would revive plans for manned missions to the Moon. Nine days after the crash where seven people died in Berkshire when the high speed First Great Western London to Plymouth service ploughed into a car on a level crossing, a Central Trains Lincoln to Peterbourgh commuter service has struck a level crossing gate which was in the wrong position. This time there were no fatalities, and the train was not derailed. After the Potters Bar crash in 2002, the rail network more or less ground to a halt after speed restrictions were imposed due to safety fears. But like anyone who routinely uses the railways, I've noticed that recently things were actually starting to get better. We were actually on our way back towards a working rail network again. But with two similar accidents so close together we're in danger of it all happening again. The question that surely has to be asked is why doesn't the government give the rail network the cash it so obviously needs to resolve the problems? What happened to an integrated transport policy? ESA's Mars Express has just returned the first high resolution images of the Martian moon Phobos. 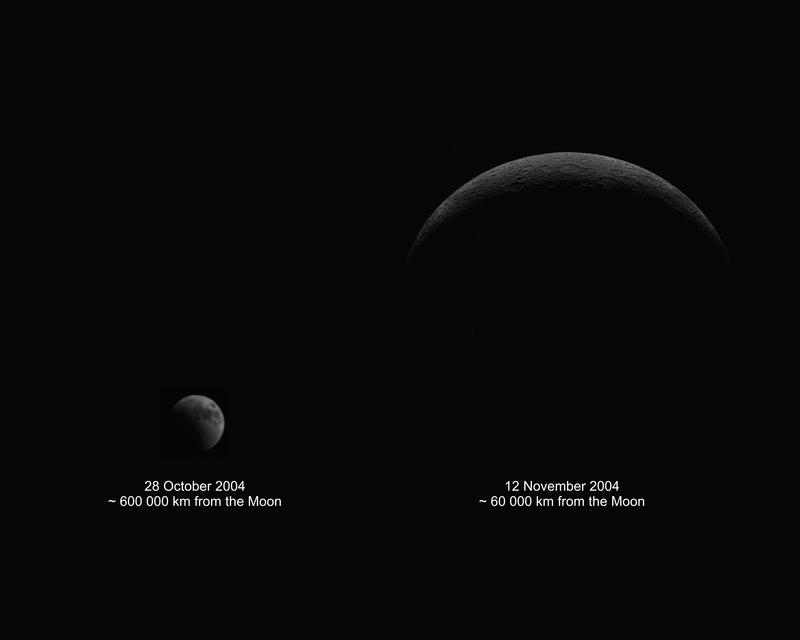 Taken from a distance of less than 200km, these images have a resolution of 7m per pixel. Phobos is thought to be in an unstable orbit, slowly spriallying towards the Martian surface, its eventual fate to be torn apart, or to impact on the surface. The Mars Express images places Phobos 5km ahead of its predicted position, providing evidence to support this theory. You can see it coming can't you? I wonder how long before the UK government has a similar idea. A penny hike on all text messages perhaps? Text messages used to be free. Back when GSM phones were first introduced into this country nobody thought anyone would want to send 140 odd character messages to each other, so there wasn't any way to bill for them. Text messages traffic was part of the network overhead, originally designed into the system for things like SIM updates. The networks were suprised when we started using them, it didn't make sense to them. But when they finally realised there was money to be made, and introduced a billing scheme, we all paid and started sending even more. Although even today, most people still don't understand that text messages aren't guaranteed delivery. They're still part of the overhead. In the long term it's unlikely. Unsuprisingly the politicians don't really understand the technology, or the culture behind its use. Let's face it text messages could be replaced, every handset sold in the UK these days has GPRS. At least, every handset that anyone would be caught in public with, and that means ubiquitous access to packet data. Which means, in the long term, text messages are yesterday's technology. They could tax packet data then, a few pence for each Mb of data sent form your mobile phone? Perhaps, but it's a lot harder to work out how to do this than it is to tax text messages which have a central choke point. How do you go about taxing bluetooth, or wireless? Not relevant? Perhaps not today, but convergence devices with GSM, Bluetooth and WiFi support are already starting to appear. You could imagine sending a message which hops from your phone to a nearby phone, via Bluetooth, as that phone happened to be going in the right direction. The message would then hop to another phone, and another, until it was in range of an open wireless access point, and from there onto the Internet. As we all know, once you're on the internet, you can go anywhere, and at the far end the same process happens. At no point during this process does your message pass some centrally regulated network choke point. The networks would have a hard time charging you for the traffic, and it's almost certainly totally untaxable. Interestingly, it'd also be quite hard to trace the originator of the message in such an ad-hoc scheme. Peer-to-peer networking is coming, anyone thinking about trying to implement centrally managed network solutions should think seriously about what they're trying to accomplish with their project. The real world doesn't work in the same way as the traditional network topologies do, the real world is small and flat. Soon after registering Delicious Library it stopped working with a Beta 4 Expired error. Mailing the support address on the website got me a email back, one minute and eleven seconds later in fact, from Mike Matas telling me that they'd "forgot to pull the expiration stuff out of [the] final release" and promising that it'd be fixed soon. Twenty minutes later I got another email saying that it was fixed and that a new disk image was available on the website. You can't really argue with that level of support. Am I impressed enough to buy it? John's article may initally appear to be a normal software review, but he ends up talking about how and why Mac software differs from software you find on other platforms. If you develop software, even for other platforms, this article is worth reading. Ah, it looks like we have an actual identifiable hardware fault with my desktop machine. When my machine was gutted, and then reassembled, the PSU failed. It looks like it's got the bulging capacitor problem. That could explain why the fault was very intermittent at least. I was out of town over the weekend, and by late Saturday night when I got round to checking my email, it had shuffled off the mortal coil again. I'm currently getting kernel: no vm86_info: BAD errors in /var/log/messages, which vaguely suggests bad memory to me although I'm not entirely sure at this point. My machine has been unplugged, put onto a trolley, and rolled away into the bowels of the department. I must admit to a feeling of vast unease as I watched it getting taken away, almost as if I was loosing a child. We really do invest far too much anthropomorphism in our machines. Or is it just me that talks to my computer? Since coming back from ADASS I've been trying to find more information about VOSpec and it looks like a lot of other people are doing the same, my post about it is getting a good number of hits. What's scared me is that my post is, at least according to the Google PageRank algorithim, the most useful piece of information about the tool on the web at the moment. It's very odd that these guys have talked about this software at several conferences and yet there isn't any information about it, let alone a beta or even alpha release of the tool, on the web. Something I saw a lot of during my recent trip to California was literature trying to persuade me to vote for, or against, something called Proposition 71. For most of my time out there I couldn't figure out what everyone was going on about, but it turns out that this was a vote to decide whether, "The state would establish a new state medical research institute and authorize the issuance of $3 billion in state general obligation bonds to provide funding for stem cell research and research facilities in California". Interestingly, in a break from the party line, the Yes on 71 Coalition included the Republican California Governor, Arnold Schwarzenegger. I was pleased to see that this measure was approved by a decent margin, it looks like someone out there is actually thinking about the future. Kerry has conceded, despite the outstanding issues with Ohio. Strange, but in the UK we count all the votes before deciding who has won, and then if the result was close, we count them again. For a while it looked very likely that we'd ended up with hanging chad again, this time in Ohio. But as time passes it's only looking mathematically, rather than actually, possible for Kerry to win. Bush currently has a lead of around 137,000 votes in Ohio, and with only 146,000 provisional ballots awaiting counting, Kerry would have to win almost all of them to gain the Presidency. Well I'm currently installing Scientific Linux onto dastardly, my ailing desktop machine, as we're not entirely convinced we know what's wrong and therefore don't really know what else to do with it. Like any intermittent technical problem I'm going to have to put up with it something fails dramatically and we can figure out what is actually going wrong with the hardware. Time for a nice new shiny PowerMac G5 perhaps? The Register is reporting that Google's GMail is vulnerable to a security explot that could give an intruder full access to your email. I must admit to being unsuprised. Web applications are notoriously hard to secure, this hole will be fixed, but there will be others. I wasn't alone in my misery, indeed compared to some I was relatively well off. Storms closed the Dawlish coastal route. Waves crashed over the lines, cutting power to two Virgin trains, stranding them and their passangers who later had to be rescued. I'm on my way down to Plymouth tommorrow morning so I'm hoping the line is reopened, otherwise I'm in for no end of grief. Unlike the outward journey, where I was flying direct to LAX from Heathrow, I ended up having to go via Chicago on the return leg. Now normally, I wouldn't mind this, as I know Chicago airport fairly well. But half an hour after our scheduled take off time we were still sitting at the gate in LAX. It didn't bode well for making my connection back to the UK, and since my connection was the last flight of the day I'd probably get stuck in Chicago for an unscheduled layover if I missed it. According to the ground staff at LAX, who were looking fairly harassed by this point, the delay was due to the airspace over Chicago being, well, full. In the end I think they bundled us aboard the 747 just to get rid of us, as we sat on the tarmac for another half an hour after they closed the doors before we got pushback. In the end we took off from LAX an hour late, considering I had an hour and twenty minutes to change planes in Chicago I wasn't actually in too bad shape. I was definately going to make it, so long as we weren't stacked and racked over Chicago. The chances of my luggage making it were, of course, fairly slim. Ariving into Chicago I got lucky, my gate for the Heathrow flight was only two down from my arriving flight, an easy change considering I had a full 10 minutes before they were going to close the doors to get there. When I got there I thought I'd got turned around, the gate was suspicously empty for a flight that was scheduled to depart "real soon now", where were the queues, the massed throngs of people? It turns out that 3/4 of the people scheduled to be on the flight were stuck over in a different terminal on another (late) plane. I walked onto the plane, almost one of the first to arrive. When I made it back into Heathrow, my luggage even turned up, now that's what I call service. We've just wrapped up the conference with closing comments from Arnold Rots. Next year's ADASS, the 15th annual, will be held in San Lorenzo de El Escorial close to Madrid in Spain. Eric Sessoms talked about hardware accelaration for astronomical data analysis. He compared the performance of your GPU to the main CPU of your machine. Typically the performance of a commodity graphics card exceeds by a factor of 3 that of your CPU. More information about using GPUs for general purpose computation is available at the gpgpu.org site. The online Apple iPod Store says that "Instant gratification [is] available at an Apple retail store or an iPod reseller near you". Well I'm all for instant gratification so along with the JAC crowd, and purely in the interests of online journalism, I ducked out of the conference and went down to the Apple Store in Pasadena. Another snippet of news from the plenary talk was that the Cassini probe sucessfully carried out its flyby of Titan last night. Data download continued through the night into the early morning hours of this morning. The flyby was by far the closest any spacecraft has ever come to Titan. This image is one of the closest ever taken of Saturn's hazy moon Titan. It was captured by Cassini's imaging science subsystem on Oct. 26, 2004, as the spacecraft flew by Titan. At its closest, Cassini was 745 miles above the moon, 300 times closer than during its first flyby on Jul. 3, 2004. The Huygens probe, built and operated by the ESA, is still attached to Cassini and is scheduled for release on Christmas Eve. It will then attempt a touch down on Titan on Jan. 14 next year. Update: The Huygens probe sucessfully landed on the surface of Titan at the start of 2005. Listening to the plenary speech this morning one snippet of interest is that, despite the bad landing, it looks like the samples from the Genesis probe remained intact enough to get some science output from the mission. Apparently there will be "almost no data loss", which is good news considering how badly beaten up the probe must have been after the crash. Last night was the conference banquet, weirdly enough it was held at a Santa Anita Park which would have made a lot more sense if there was a race for us to watch during the meal. The after dinner speaker was Raymond Arvidson, from JPL, who talked about the Spirit and Opportunity Mars rover missions. Spirit and Opportunity, or the Red Sox playing in the World Series?